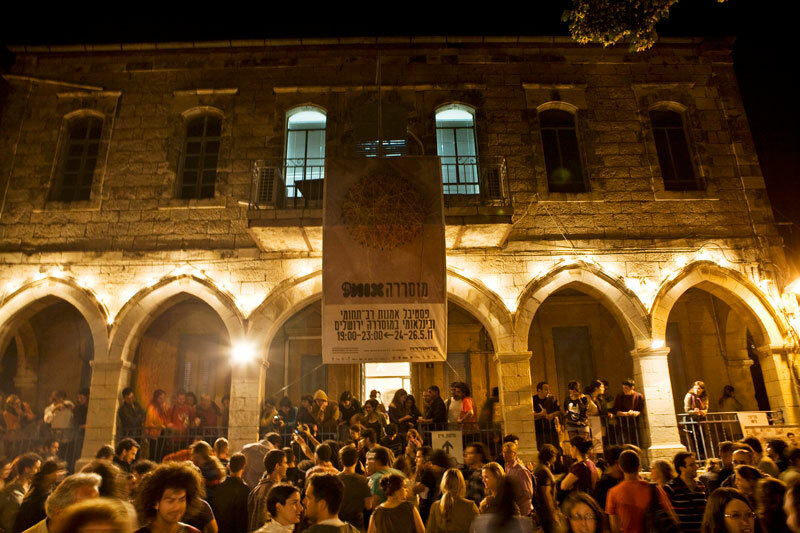 In 2011 I was invited to curate an exhibition for Musrara Mix Festival in Jerusalem. The festival takes place in the scenic neighborhood of Musrara in Jerusalem. Over the three-day festival the neighborhood operates as a platform of exchange enabled by local residents who offer their private courtyards, building facades, streets and public square for an extensive programme that includes installation, video projections, performance art, dance and a variety of live sound and music performances. Artists are invited to exhibit artwork outdoors and in doing so to respond to the location and local community. Musrara is a neighborhood situated quite literally on the divide between ‘east’ and ‘west’ and Its inhabitants preserve turbulent memories of assimilation processes of different communities through the years. Musrara Mix acts as a cosmopolitan microcosm, searching for the underpinnings of the Israeli reality whilst inviting international artists to participate, react and expand on these ideas, adding their own layers of experience and theoretical ideas. The festival presents a rich accompanying programme of artist talks, lectures & workshops. The Fourth Wall is an exhibition that brings together the work of ten international contemporary artists. Their respective practices harnesses non-actor participants, communities and viewers in their production, or utilises their own physical involvement or intervention within public space and community. All these artists are primarily concerned with collaboration, conversation and dialogue as a means of creating artwork, often using performance as a starting point for the private and public realms to intersect. Whether choosing a directorial role or working as a facilitator, each artist locates themselves, in their own way, within the collective. Beginning with a theatrical and performative situation, each work breaks down the imaginary boundary between any fictional work and its audience, ‘The Fourth Wall’, enabling an exchange between the artist and the audience and for ideas to become tangible. Socially engaged art questions the role of the artist as a solitary maker with a ‘singular’ inner voice that transcends reality. 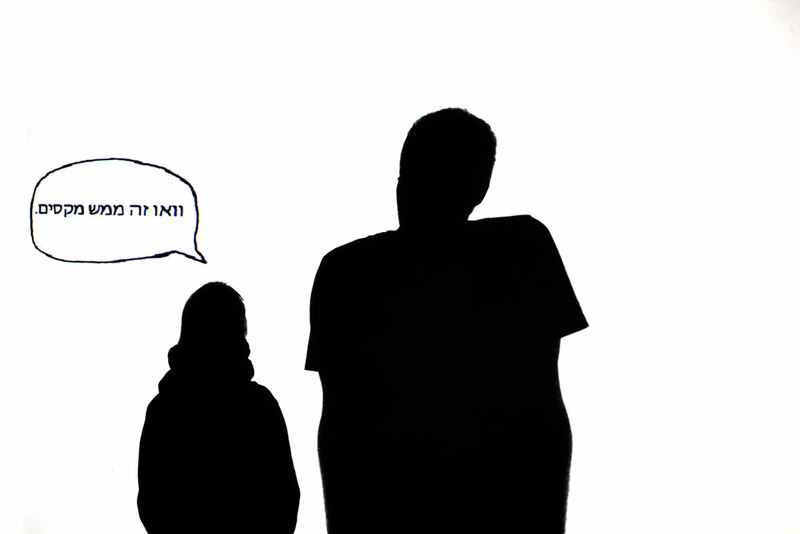 These artists choose to examine their own voice when positioning themselves within a group. They examine the cultural and political dimensions that drive art, a desire for wholeness and authenticity in an art piece and the fragmentation in the reality of producing ones art inseparable from society. The projects are an inquiry into the relationships we all maintain with our surroundings, how we form our realities and utopias and how we are involved as individuals and as participants. Participating artists: Henna-Riikka Halonen (Finland), Arnaud Moinet (France), Xin Wang (China), Karin Kihlberg & Reuben Henry (Denemark and UK), Tellervo Kalleinen and Oliver Kochta-Kalleinen (Finland and Germany), Yvonne Buchheim (Germany), Zoë Walker and Neil Bromwich (UK). 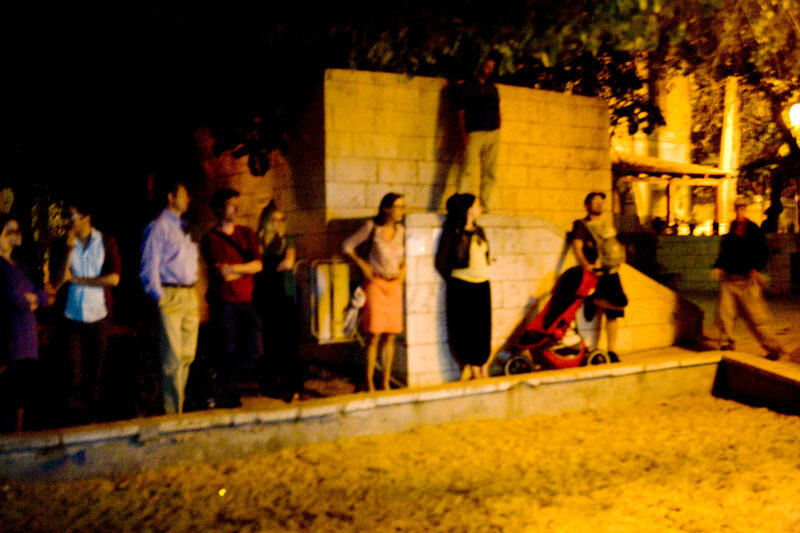 For this project in Musrara, Jerusalem, the artists playfully question, what is the role of art in cultural exchange. While not directly political, our work 12 Yellow Stars resonates with the contested borders of Jerusalem. Instead of directly commenting on this reality of Israel and Palestine, which they feel they have only mediated ideas on, they choose to act as ambassadors of European ‘ideals’ and will literally bring this baggage with them in a form of a comic book story for young people about a peaceful Europe without frontiers, called The Raspberry Ice Cream War, using it a s structure for discussion during a filmed tour of Jerusalem. This tour involved some local participants (6), a local tour guide, us as two artists and the festival curator, and is based in 6 different location stops. Each stop framed as a cartoon vignette (tableaux vivants), represents a point of negotiation between the artists/curator and the participants. The story of Raspberry ice Cream War promoting the idea of borderless world is functioning as a subtext, which is simply providing a solid structure through which a cultural exchange can flow. The idea is to approach the concept of border not only in geopolitical terms but also as a point of negotiation between local and European perspectives that allow something else to begin. The production was made with the support of FRAME and The Embassy of Finland. The documentation video from the event-based performance was projected onto a large screen in a children's playground. Celestial Radio is inspired by the legendary Radio Caroline the off-shore pirate radio ship, which thought the 1960s and 70s represented another belief structure, free living, freedom of speech and ‘loving awareness’. Walker& Bromwich's glass covered boat 'the Celeste', literally travels across high seas, and draws on specific landscapes and communities focusing on social transformation, utopian ideologies and emergent hope. The film charts Celestial Radio’s first broadcast 'How the Universe Sang Itself in to Being', mixing together interviews with diverse communities living along the Essex coastline, finding a meeting point between science and religion. Together with the special screening of 'Celestial Radio' Zoe and Neil have also collected interviews around the 'Voice of Peace' the legendary Pirate Radio Station which broadcast to Israel and the Middle East from 1973 to 1993. Their new recordings will be broadcast as a sound installation at the festival. It will also be available on radio station over the 3 day festival. The installation was made with the support of Step Beyond Fund. Tellervo Kalleinen (FIN) & Oliver Kochta-Kalleinen (GER) present The Complaints Choirs of The World, 2005- ongoing, DV Videos. In the Finnish vocabulary exists the expression Valituskuoro, which means Complaints Choir. The word is used to comment on a group of people bragging about something together. Kalleinen & Kochta-Kalleinen decided to take this expression serious and to organize a real choir that sings about their very own complaints. This simple idea triggered a phenomenon that has now become a global movement. People all around the world were inspired by the first Complaints Choir from Birmingham organized in 2005. They understood instantly the power of the idea of transforming individual complaints into a collective song. The Complaints Choir project is based on 3 principles: (1) anybody can take part – no singing skills required, (2) any complaint is allowed – from small daily irritations to global issue, and (3) the lyrics are decided collectively by choir members. The Choirs document their performance in front of a live audience in their city and upload it to the artist's website. The festival is pleased to present the complaint choirs of Birmingham, Chicago, Hamburg, St. Petersburg, Helsinki, Tokyo and Singapore. 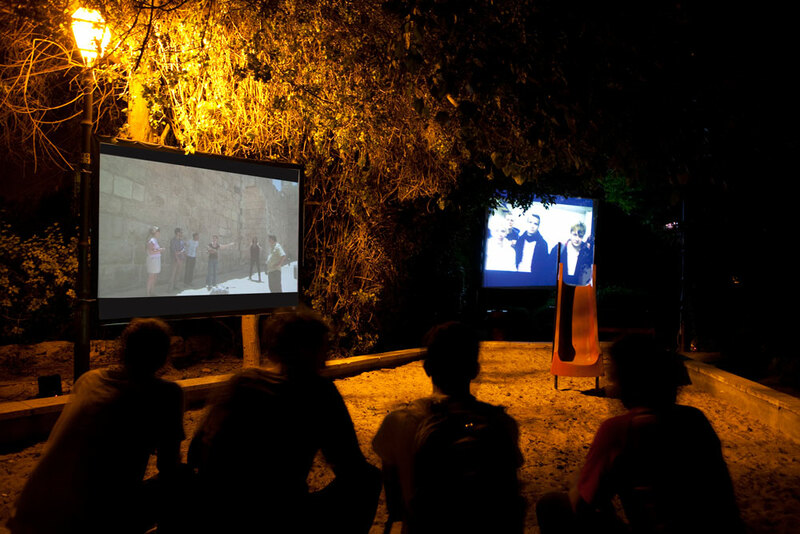 The videos are presented in televisions dispersed in a private courtyard of a home in the neighborhood of Musrara. Xin Wang’s practice is primarily concerned with communication. In her interactive piece ‘We Sit And We Talk’ she creates a three-walled space similar to that of a theatre stage. Animated text boxes projected onto the central wall display internal, private thoughts of the artist. Viewer/s seated in the space, throw their shadow on the wall and become participant protagonists of these thought-scapes and actors in this theatre. For Musrara Mix Festival Xin has configured this piece for an Israeli audience, so that it will feature Hebrew English and Chinese conversation. Karin Kihlberg and Reuben Henry's work deals with how the documentary constructs and negotiates the narrated image. Working with a range of media such as video, performance, drawing, events and publications they explore various interrelationships between constructs of time, history and fiction, and their relationship to the viewer in time and space. The video was projected onto a large screen in a children's playground. Artist Yvonne Buchheim has set up the Song Archive Project in 2003 in response to a song collection from 1773 by Johann G. Herder. His collection and theory suggests that the cultural identity of a people is reflected through their song tradition. The aim of the Song Archive Project is to develop a body of works that examine contemporary song culture in a visual art context. Buchheim invites people to perform a song of their choice in front of a video camera. In this way, singing, often a private act is made into an unrehearsed public performance. The project now includes over 900 amateur song performances from six diverse cultures and countries. This project takes its title from a Polish folktale with a same name and was filmed in Limerick City Hall, Ireland. The performers, Polish construction workers living in Limerick at that time, form a slow action, which is a combination of their work movements and is disrupted by a choreography, introduced by the artist. The workers became protagonists of a theatrical performance that functions as surreal spectacle both bizarre and poetic, influenced by Bio Mechanic exercises of Soviet Avant –Garde theatre and cinema. 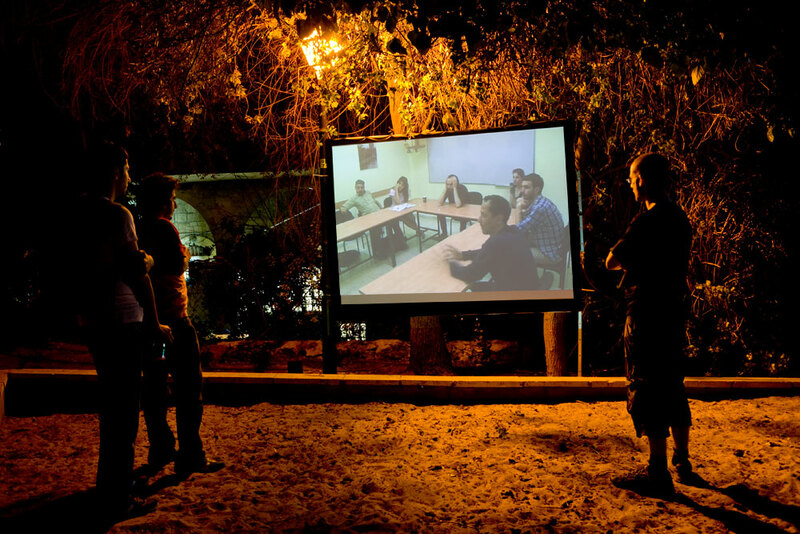 The movie was projected across the facade of a community bomb shelter in the neighborhood.